Eliminate any possibility of a backed up bathtub when you stop every strand of hair before it washes down the drain. This fun looking device installs in seconds, and it's guaranteed to collect ever single piece of human hair, or pet fur that washes through it. The weird shape gives it the look of a mushroom, but it's highly effective, and it works in any standard bathtub drain. Once in place, it will collect hair and other debris below the surface, and out of sight. Larger stuff will be stopped by the mushroom top and lack of space, while smaller stuff will wash down through the strainer. Holes on every surface allow water to flow quickly, and the natural circular motion of the draining water causes hair to wrap around the spool-like core, and collect in a tidy bunch. Once it's full, just pop it out to wipe it clean in seconds, and then pop it back in place to continue protecting your pipes. It's way more effective than the basic cover that most tubs come with, and it will outlast, and outperform other hair catching drain strainers. No pet owner should be without one, but any homeowner will also appreciate the piece of mind it provides. No more plunging stopped up drains, or snaking out large clumps of hair after the water stops flowing, and no more resorting to dangerous chemicals to burn through the clog. With this strainer in place, you'll never have to worry about unwanted gunk building up in your pipes because the biggest culprits will be stopped in their tracks. This strange-looking silicone cylinder is one of the easiest ways to avoid time consuming maintenance, and guarantee a properly functioning drain in your bathtub. Highly Effective. You'll be amazed at how much hair you collect because no strand will flow down the drain. Instead, long and short pieces will wind around the center, and gather together neatly, so that you can dispose of them properly. Multi-Tasker. Pet fur, human hair, long, short, thin, thick; it doesn't matter. This hair catcher works on all types of hair and fur. Fill it up each time you bathe Fido, or keep it in place to collect hair from a week's worth of showers. Fully Compatible. It works in any standard tub drain, so if you have a regular bathtub, and not a shower stall, it should fit perfectly. No Touching. The large top gives it a signature look, but it also allows you to take the strainer out of the drain easily, and without touching any of the stuff that was collected. Totally Reusable. This thing never wears out, or loses effectiveness. Use it for years without replacing it, and still catch every single hair. Top Quality. Because it's made from a high quality silicone material, it's extremely durable, long-lasting, washable, and resistant to stains, odors or mildew. The premium material also guarantees consistent performance without risk of failure, or premature wear. Non-Toxic. For most people, clogged drains are not prevented, they are cleared after the fact. Because dangerous liquids are the easiest way to clear a backed up drain, they are widely used. This safe and effective alternative will allow you to avoid toxic products, and still keep the water flowing freely. Out Of Sight. Other drain protectors force you to look at the hair as it collects, or they allow it to float off, and pool around the drain. This one traps hair on the interior of the drain so you never have to look at it, or worry about it escaping. Compact. Much less conspicuous when compared to other options, the compact, low-profile design looks good without compromising performance. Easy Maintenance. Just pop it out and wipe it clean whenever it gets full, and then pop back in place to continue using. Most people can go several days between cleanings, and if it's in need of a thorough cleaning, it's totally dishwasher safe. Tight Fit. Unlike other options that float up and uninstall when the tub is filled with water, this one stays in place. Not only convenient, this feature ensures that you don't have to remember to reinstall as you drain your bath water. Design and material combine to create the perfect device for preventing clogged bathtub drains. As you press it into place, the tapered sides create a watertight seal around the outer edge, and ensure that all water and debris have to flow through the strainer. 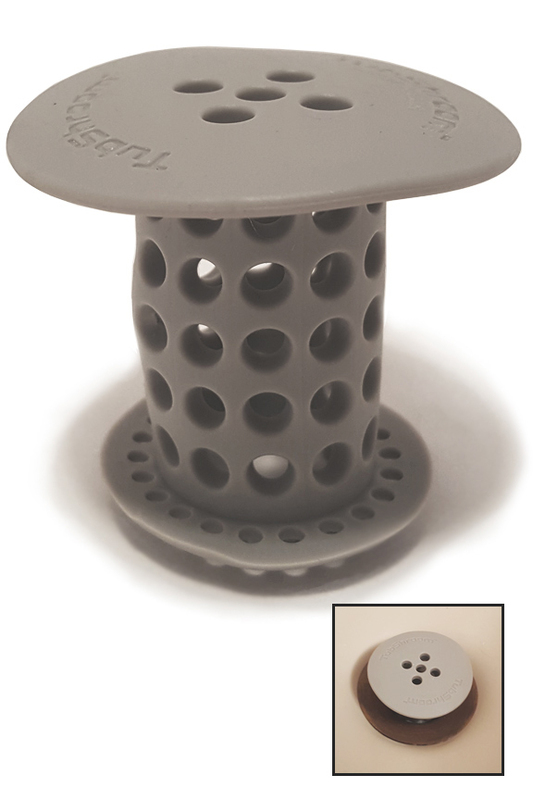 Tiny feet elevate it slightly, and when combined with the multitude of holes on all surfaces, they allow water to flow freely through the device. As stuff washes down the drain, it gets trapped in the quarter inch space around the core of the strainer. Anything larger than hair will collect at the base, and the swirling action of the drain will cause hair and fur to coil around the core like thread on a spool. Anything larger than 1/4" will be denied entry, so no drain clogging debris will ever enter your pipes. The universal design fit snuggly in all standard tub drains, and it installs in seconds without any tools required. Anyone can replace the factory installed drain cover with this improved alternative, but follow the instructions below to ensure proper function, and long lasting performance. You may have an ineffective strainer already installed, or you may have a basic cover attached with a single screw. 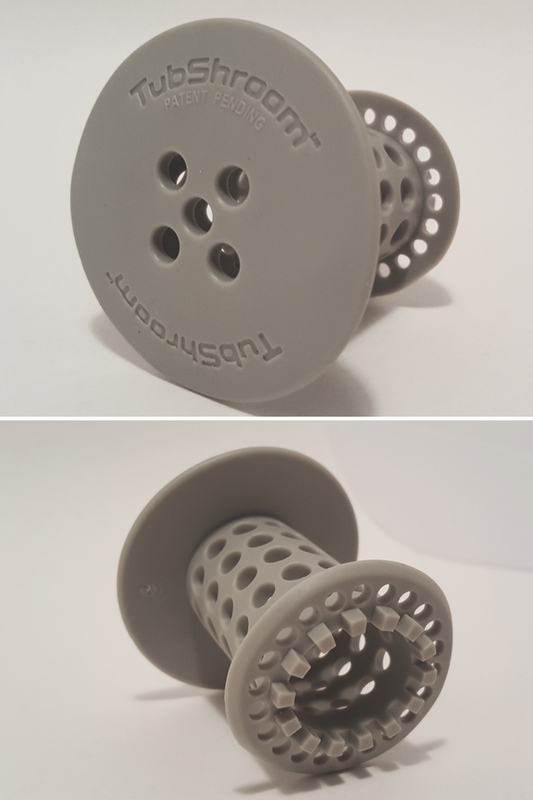 To prepare the drain for this mushroom-shaped drain strainer and hair catcher, simply remove what is there to revel the open drain hole. Once the drain is clear, press the hair catcher into place. Apply pressure at the top with your thumb, and push all-the-way down to ensure a proper fit. The mushroom top should stick up out of the drain, but only slightly. Once installed, water will flow through the holes, and hair will naturally trap itself, and coil around the core. The tight fit and silicone construction guarantees that no debris will bypass the strainer, and every strand of human hair or pet fur will be collected. Remove the strainer without touching any of the stuff it collected using the large lid, and clean when full by wiping everything into a trashcan. Dishwasher safe for thorough cleaning, and totally reusable for years of use. Dimensions 2.25" x 2.25" x 2"
Uses Avoid clogged pipes by stopping every strand of hair before it washes away. The unique design collects hair and pet fur out of site without restricting the flow of water. Compatibility Fits standard, 1.5" bathtub drains. Just remove the metal cover, and this one will secure snuggly inside. Catches long or short hair, and works just as well on human hair or pet fur. Water Flow High. A large number of holes allow for free flow of water, even while stopping long hair and other dirt. Maintenance Just wipe hair into the garbage when full. Most can shower for a week or more between cleanings. Avoid toxic drain cleaning solutions that destroy your pipes over time, and forget about plungers or snakes. 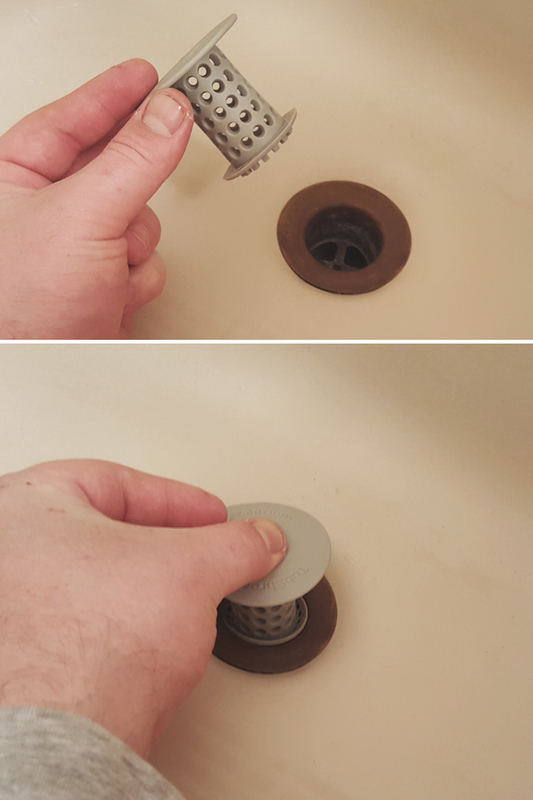 Pop this amazing little drain strainer in place, and it will prevent any hair from washing down, so you'll never have to worry about clogged drains again. Order Yours Today! 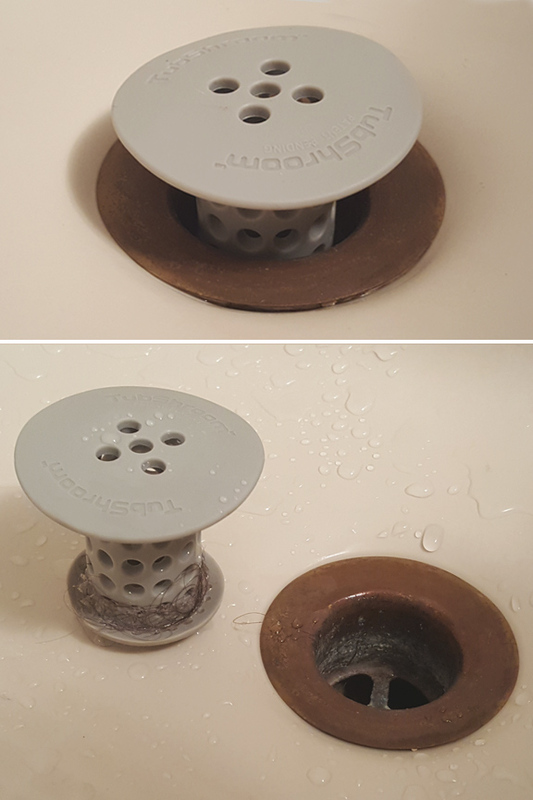 It fits in my shower/bath drain after removing the drain plug with a screwdriver. It does a great job of catching the hair without disturbing the water flow down the drain. I take it out after each shower and clean it out, just because I like to. I leave it out and let it dry until the next shower. If I want to take a bath, I will need to put the plug back in or get an old fashioned drain plug. Some drains may be different than mine.